Each MG Metro Turbo comes complete with a spare pack of pick up braids. 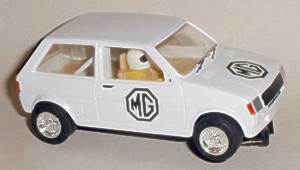 The MG Metro Turbo Challenge is unique to Scalextric Car Restorations. These MGs drive very well on the track with the Neodymium magnet overcoming the tendency for the MG to come off the track on high speed corners and gives the car the significant additional grip required to power to victory. This package makes the cars a delight to drive, they are fast and very stable on the track. Ideal for those that like to race competitively with the older generation of cars. The MG Metro Turbo Challenge is fun for all, can you collect them all !! 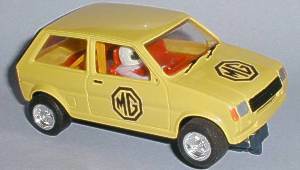 For further information on the MG Metro please visit the MG 'M' owners Club. 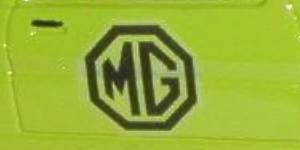 "The MG 'M' Group is run by dedicated enthusiasts for dedicated enthusiasts.....Being affiliated to the largest one-marque car club in the world, the MG Owners Club, we acknowledge the cars place in a renowned line of sports cars - but our club offers much more than that..."